© 2002, © 2019 by Paul Freeman. Revised 2/24/19. 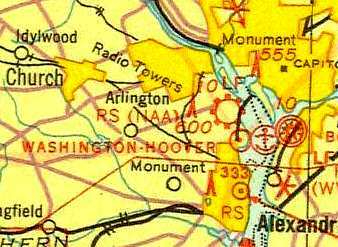 Hoover Field, as depicted (by an unlabeled red cross & circle symbol) on the 1923 Washington-NY Airway Map (courtesy of David Brooks). The date of establishment of Hoover Field Hoover Airport, Washington's first commercial airport, has not been determined. southwest of the intersection of the George Washington Parkway & the 14th Street Bridge. which depicted it (unlabeled) with the red cross & circle airfield symbol. Hoover Field was built by Thomas Mitten, the owner of the Pennsylvania Rapid Transit Company in Philadelphia. He expected to make profits by flying Washingtonians to the Philadelphia Sesquicentennial International Exposition. so perhaps 1926 was when it was acquired by Mitten. Charles Ebert, who was one of Mitten's VPs & right-hand men. Tom Mitten had set his sights on commercial flight transportation between Philly & Washington. wherein a landing field could be established. This he did & the result is Hoover Field." converted to a sod landing field, and a small terminal & 100' x 60' hangar were constructed. as the Exposition had ended, and he was unable to renew his airmail contract. 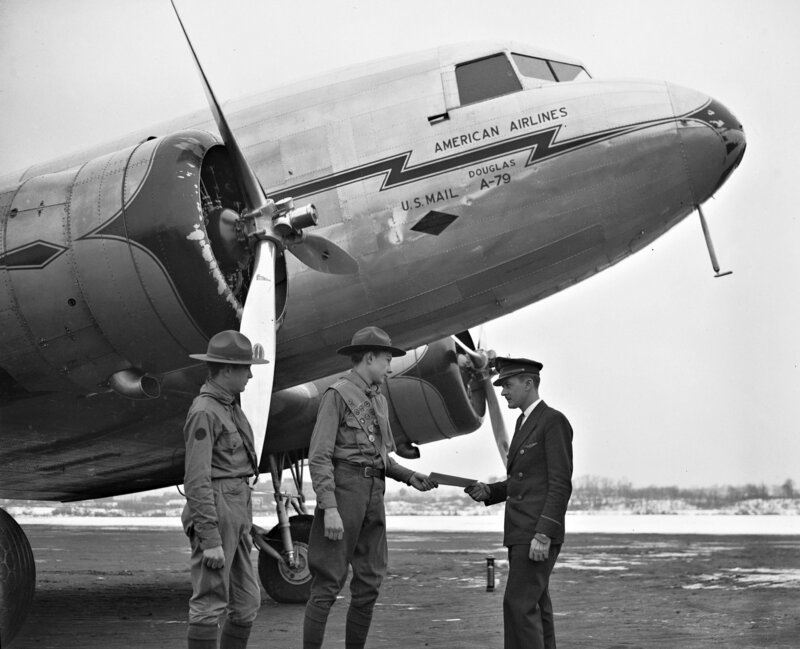 to provide air mail service between Washington, D.C. & Philadelphia for the US Postal Service. 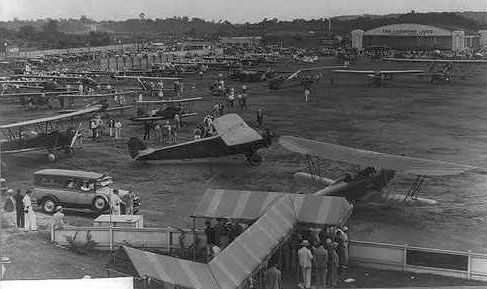 manufactured aircraft in a hangar at Hoover Field in 1926. Berliner relocated after one year to a waterfront factory in nearby Alexandria. 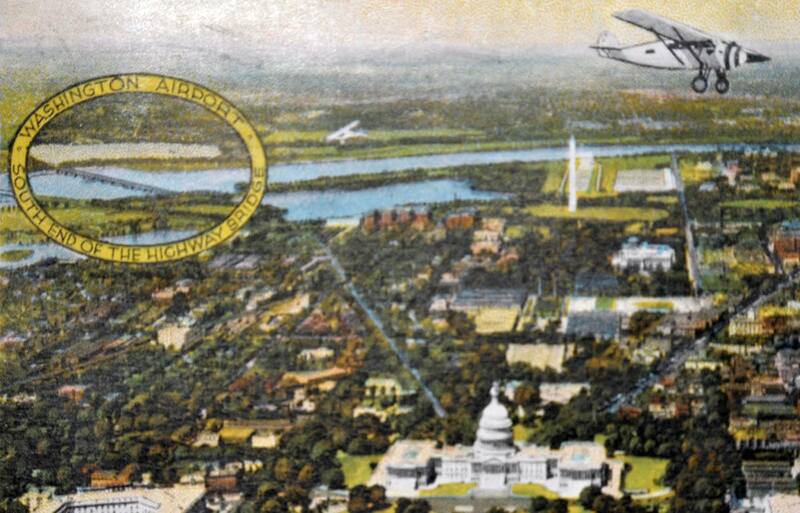 Berliner & other investors purchased Hoover Field in 1927 & incorporated the Potomac Flying Service. 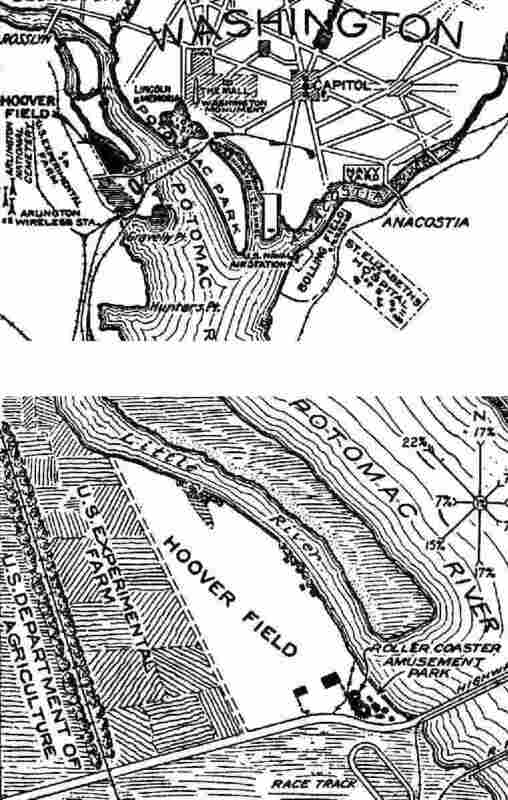 The location & layout of Hoover Field, as depicted on the 1927 Department of Commerce Airway Bulletin (courtesy of David Brooks). with buildings on the southeast corner – including a roller coast & amusement park! The owner was listed as R.W. Moore, operator of the Potomac Flying Service. across the road to the south (adjacent to Arlington Beach, an amusement park). It was a triangular shaped field, 97 acres in size. 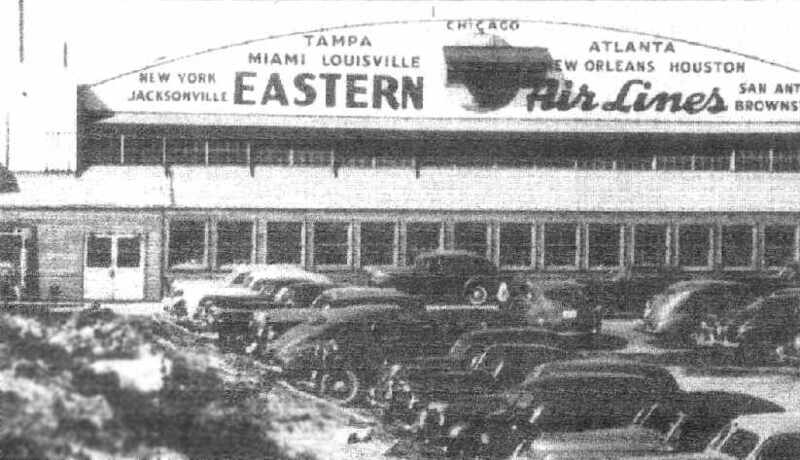 The owners of the new field established Seaboard Airlines, with a small fleet of 8-passenger planes. They operated one daily round-trip to New York, starting in 1928. 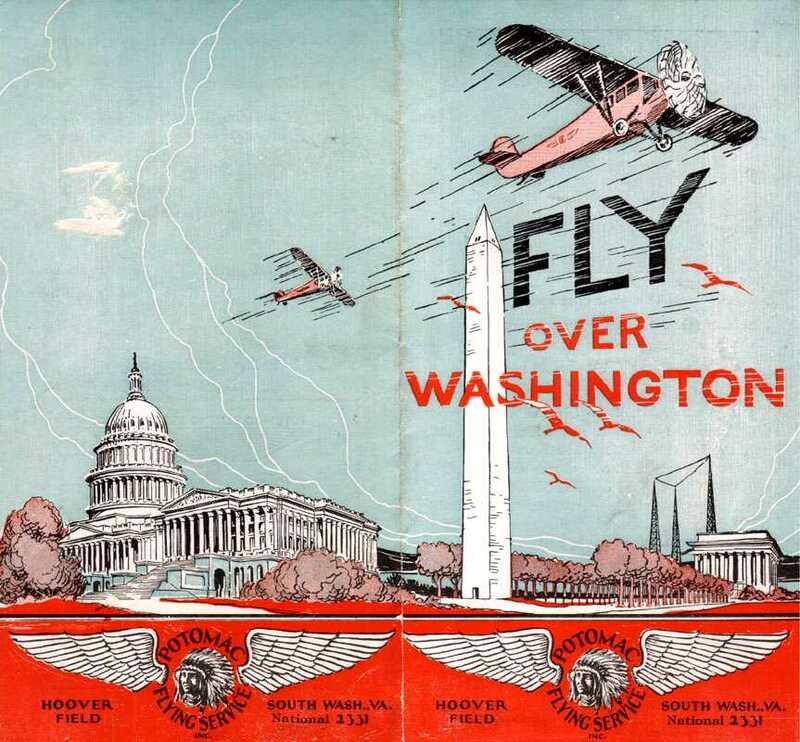 Potomac Flying Service took over 25,000 passengers for sightseeing flights over the nation's capital by 1928. 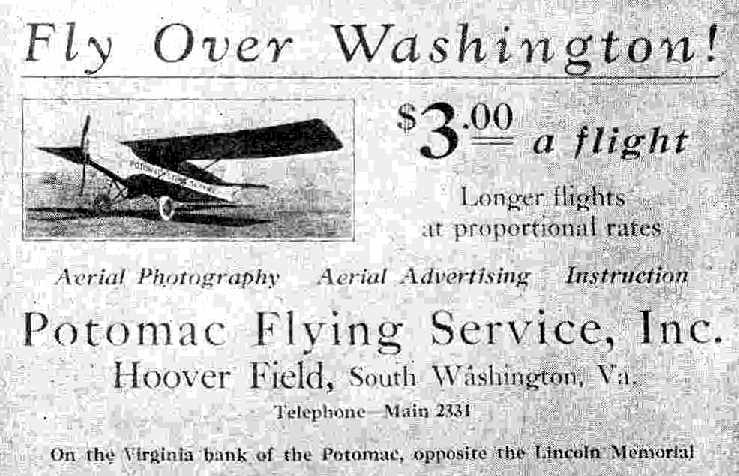 The original owners of Potomac Flying Service sold the firm & Hoover Field to E.W. Robinson (who also operated Hybla Valley Field) in 1928.
from the 4/23/28 issue of "Aviation" magazine (courtesy of Chris Kennedy). 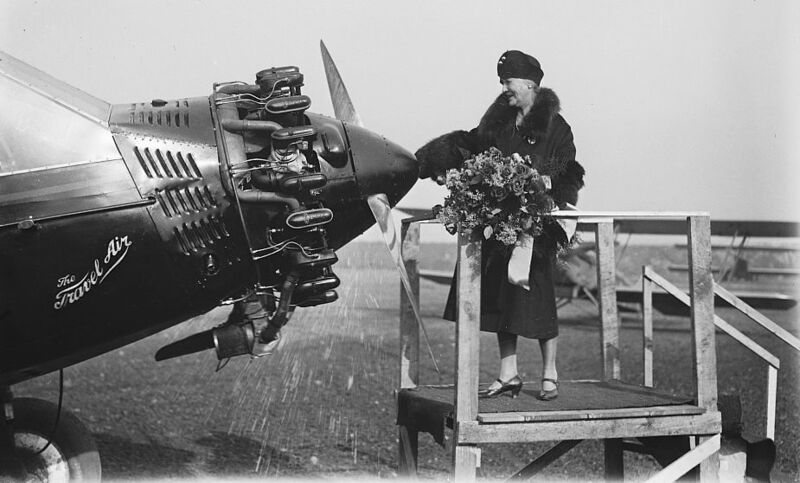 The earliest dated photo which has been located of Hoover Field was a 12/13/28 photo of the new Travelair cabin monoplane “Postmaster” being christened by Mrs. Harry New, wife of the Postmaster General. The “Postmaster” as chosen to attempt a world endurance record. 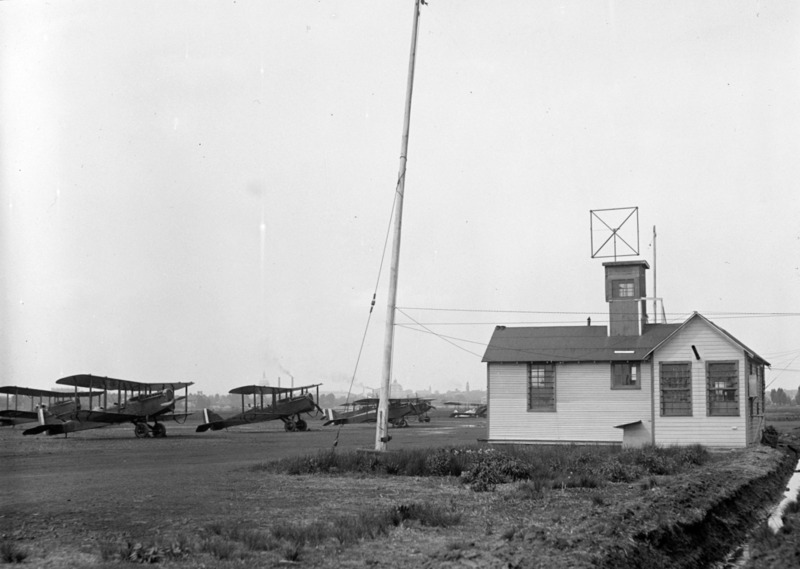 A circa 1928-30 photo of Curtis JN-4 Jenny biplanes parked next to a small building at Hoover Field, with the U.S. Capitol building dome in the background. 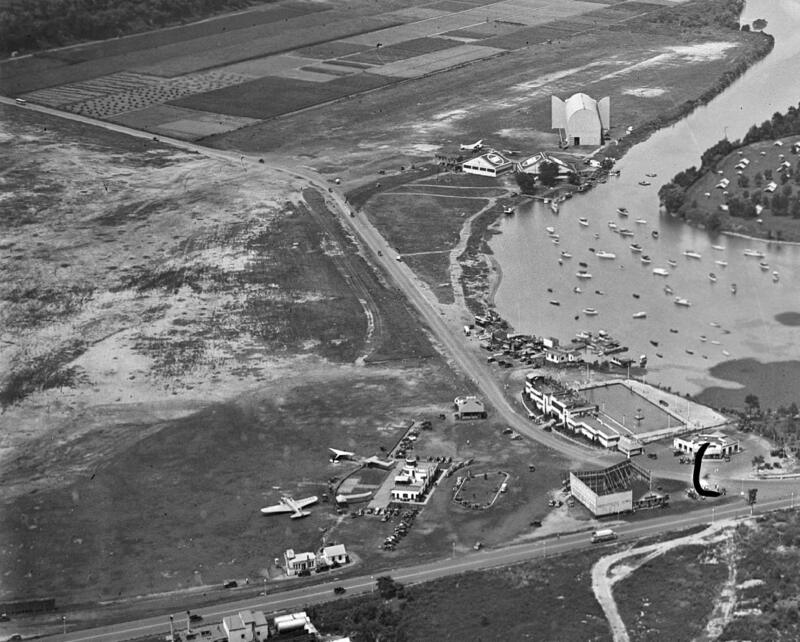 also showing Arlington Beach on the left, including the Roller Coaster, Yocum Canoe house, and various building between the highway & the Potomac River, which were razed in 1929. A circa 1920s brochure for Hoover Field's Potomac Flying Service (from the collection of Don Henchel). The 2 airfields were separated by Military Road, which was becoming a busy thoroughfare. particularly for the nation's capital. Neither field was paved, and both were plagued with short runways, poor lighting, and obstructed approaches. conducting flights to Pittsburgh's Allegheny County Airport. 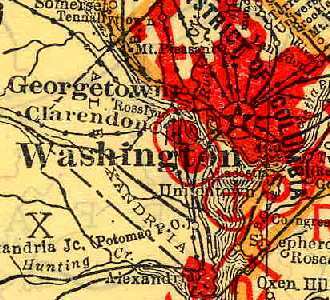 as depicted on the 1929 "Rand McNally Standard Map of MD with Air Trails" (courtesy of Chris Kennedy). and Washington Airport as measuring 1,800' x 60' in size. from a postcard with a June 1929 cancellation (courtesy of Mark Sublette). was on a 1930 Standard Oil Company road map (courtesy of Mike Keefe). whereas Hoover Field across the road to the north had hangars on its north side. to sell to the National Aviation Corporation. and began to make improvements. 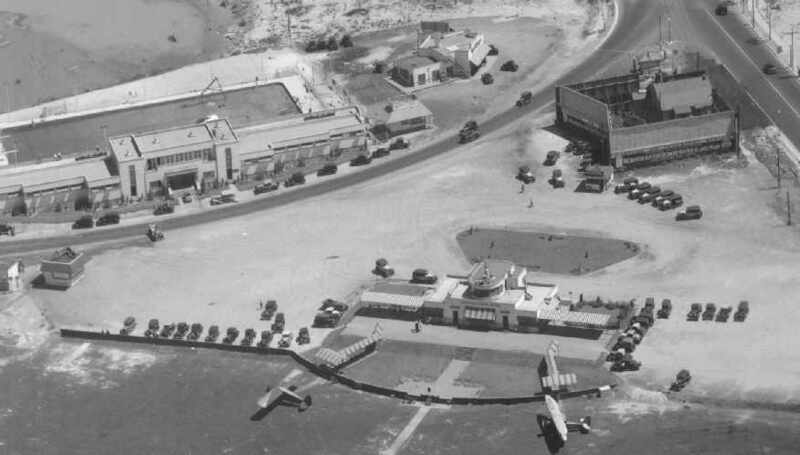 A streamlined Art-Deco terminal building & a new hangar were built in 1930. The terminal building, designed by Holden, Stott, and Hutchinson, was "a trim structure with terraced roofs". and the administration & control tower on the second level, and was very modern for its time. to serve the ever-increasing sightseeing crows as well as provide an additional revenue stream. 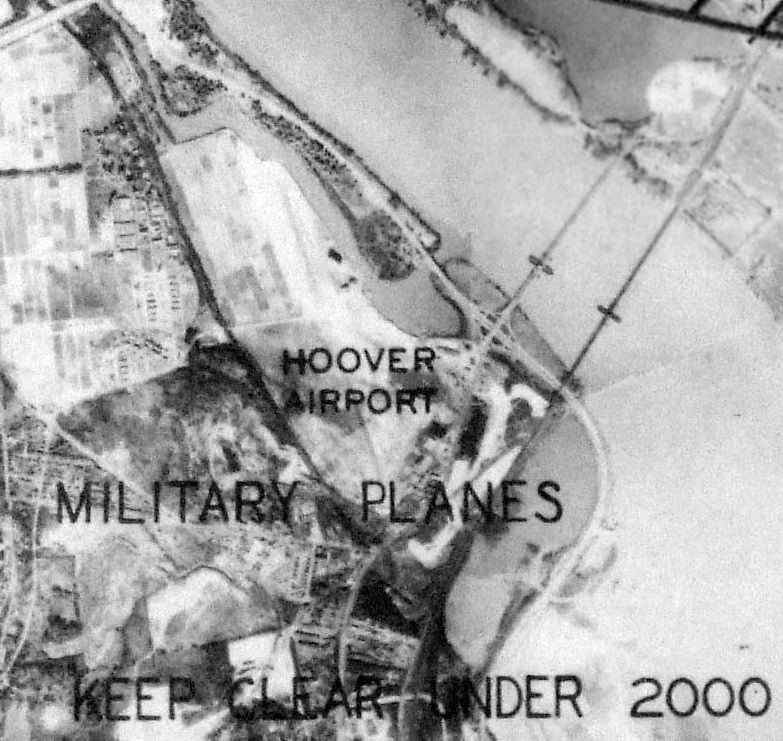 showed both Hoover Field (at upper-left) & Washington Airport (bottom-right). 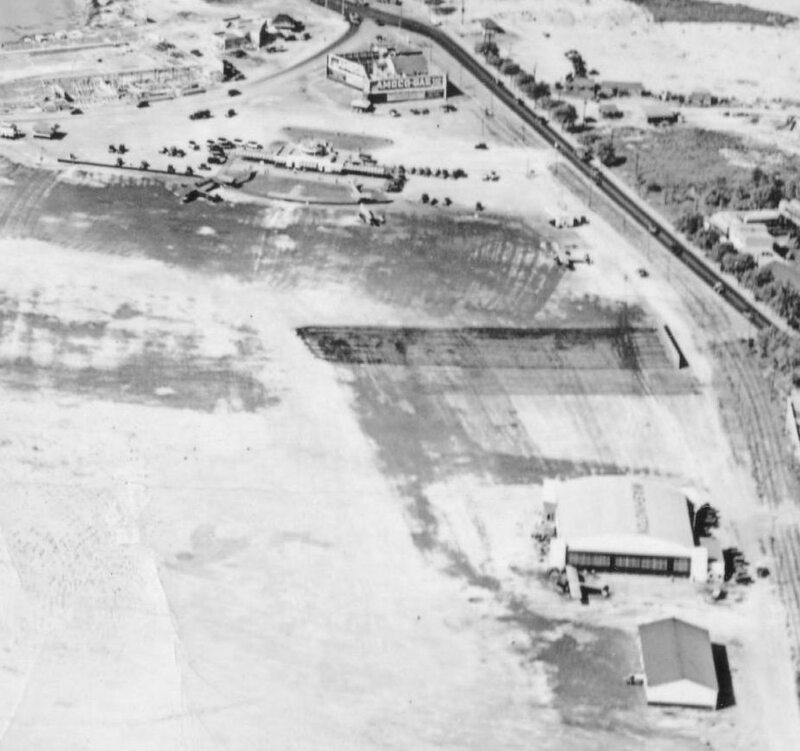 A closeup from the 6/19/31 aerial view looking northeast showing the hangars & buildings of Hoover Field. showing 3 aircraft on the field. 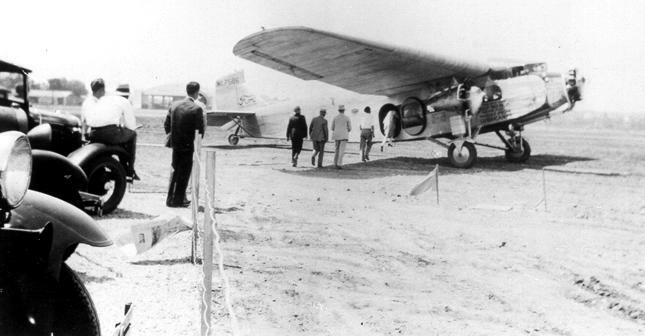 A 1931 photo showed passengers boarding an Eastern Air Transport Ford Tri-Motor at Washington Hoover Airport. 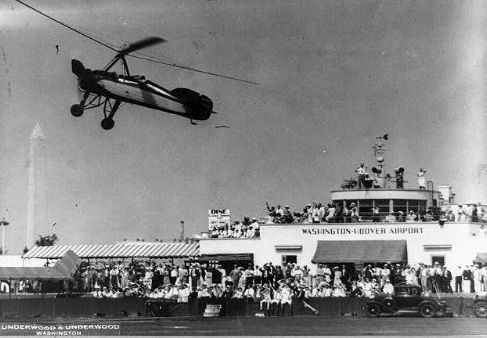 An autogiro (model unidentified) “steals the show” at the start of the 1932 Transcontinental Air Derby in front of the Washington-Hoover Airport terminal. 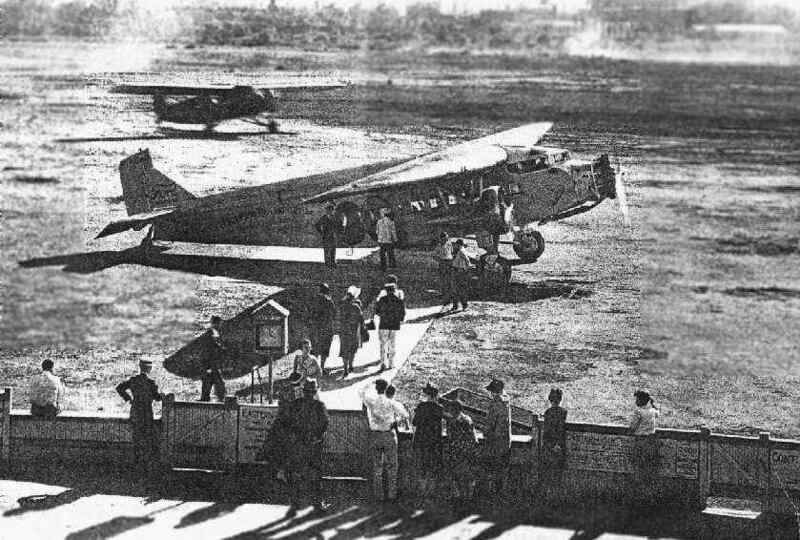 A 1932 photo of the start of the Transcontinental Air Derby at Washington-Hoover Airport. with the Washington Air Derby that my grandfather led the organization of. 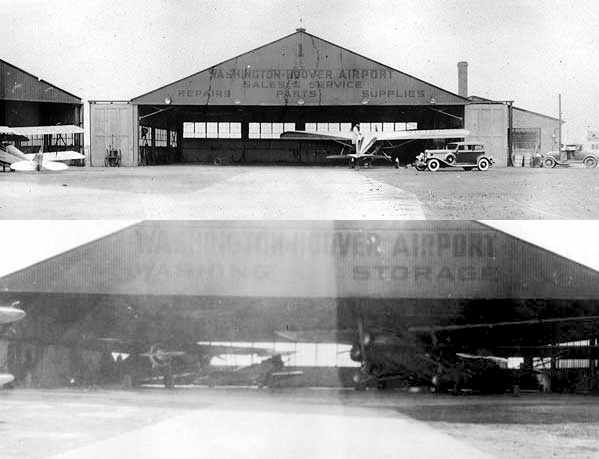 Two April 1932 photos (courtesy of Don Warrington) of hangars at Washington-Hoover Airport. A Ford Tri-Motor is visible inside the hangar in the lower photo. A 1932 aerial view looking northeast at Washington Hoover Airport (U.S. Bureau of Public Roads Photographs collection from the National Archives). The terminal is at the center foreground, with the hangar behind it. A private club with swimming pool is left of the hangar, across the street. 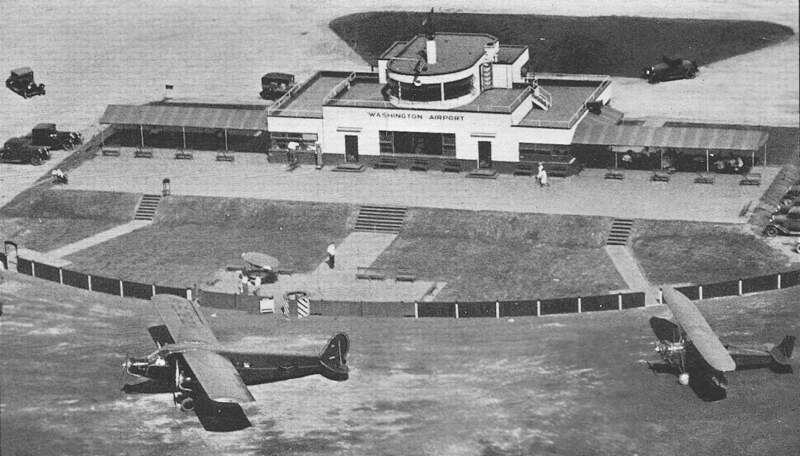 A circa 1932 photo of the Washington Airport terminal building (courtesy of George Miller). “In the early 1930s, airline pilot Shelly Charles operated an open primary glider from auto-tow at the old Washington-Hoover Airport. 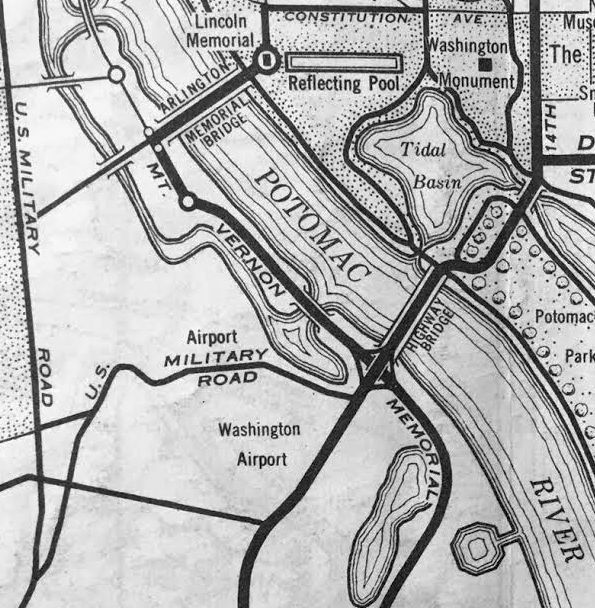 Washington-Hoover Airport, as depicted on the May 1932 J-18 Washington D. C. Airway Map (courtesy of Chris Kennedy). with the longest being a 3,000' strip. The manager was listed as John Wayne, General Manager of Atlantic Seaboard Airways, Inc.
Pennsylvania Airlines (scheduled transport), and William Payne (instruction). 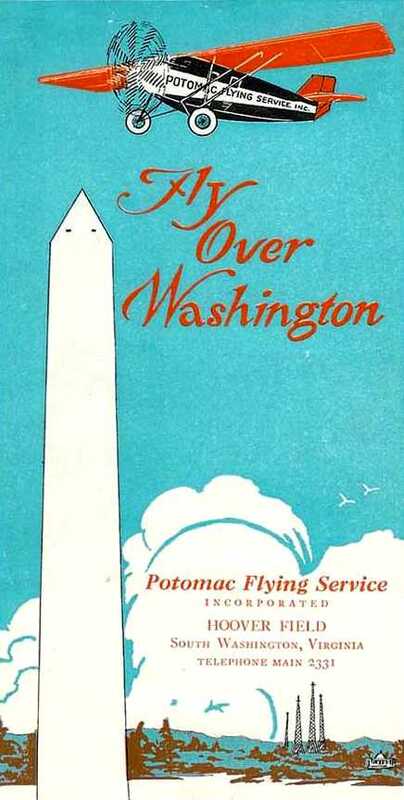 A circa 1930s brochure for Hoover Field's Potomac Flying Service (from the collection of Daniel Kusrow). A 50” x 12” sign painted on cloth of the Potomac Flying Service, for sale by Michael Schultz. An undated photo of a horse-drawn wagon in front of the Hoover terminal building. An undated aerial view looking northeast at 2 aircraft parked in front of the Washington Hoover Airport terminal building. 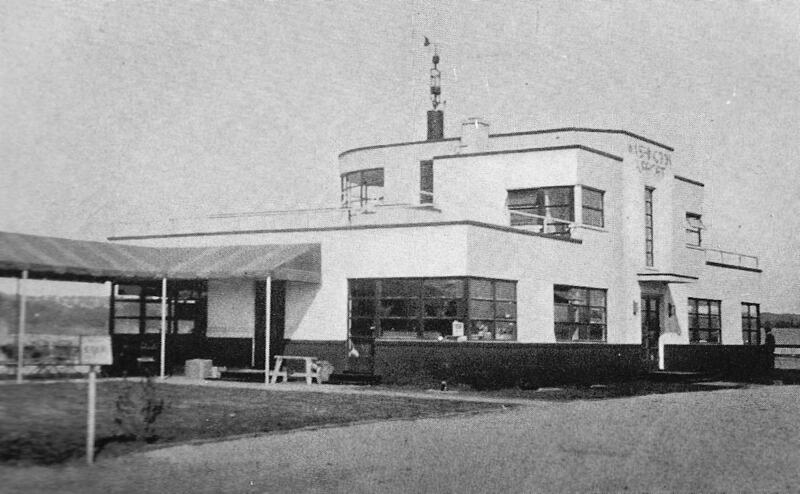 An undated photo of the Washington Hoover Airport terminal building. 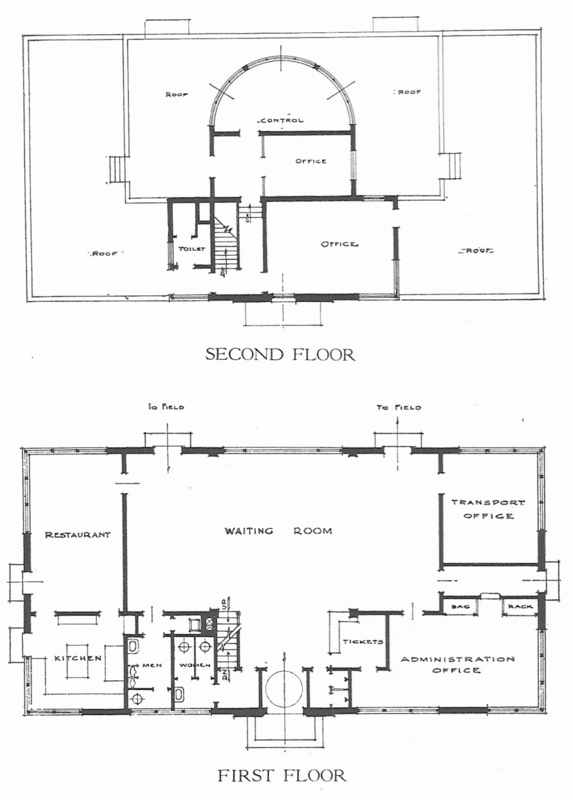 Undated architectural plans of the 1st & 2nd floors of the Washington Hoover Airport terminal building. An undated photo of passengers boarding a Ford Tri-Motor at Washington Hoover. from an auto-tow at Washington-Hoover Airport. His flights were usually of short duration before an appreciative Sunday afternoon crowd. 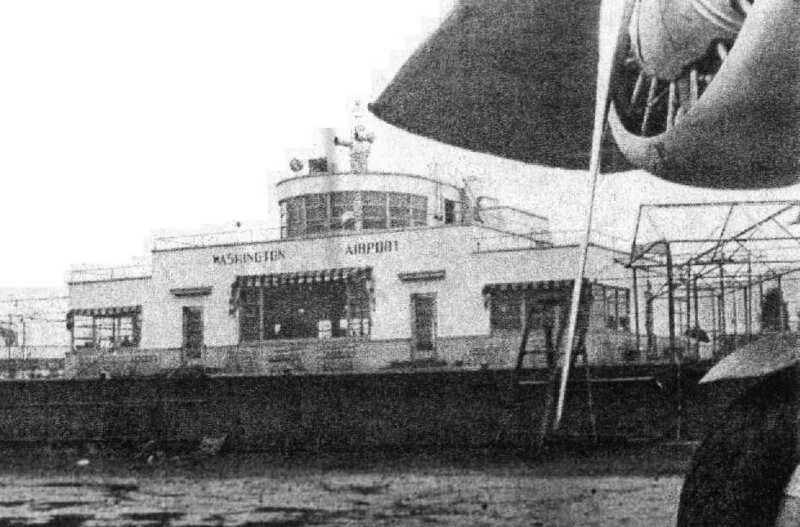 A mid-1930s view of a Boeing 247 in front of the Washington Hoover terminal. 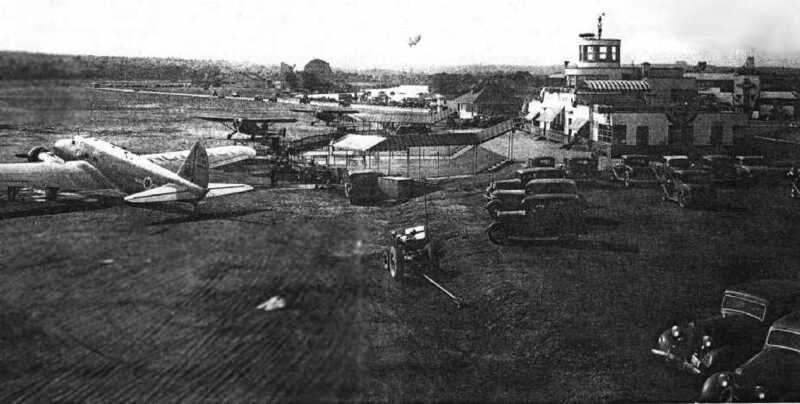 What appears to be a dirigible hangar is visible in the background, on the former Hoover Field to the north. The dirigible hangar was evidently constructed at some point after 1931. 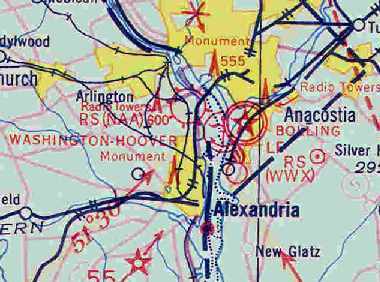 Washington Hoover Airport, as depicted on a 1934 Navy Aeronautical Chart (courtesy of Chris Kennedy). and a larger & more modern control tower was added as well. but the overall boundaries of the site constrained the ultimate length of the field to a size that was becoming a liability. A dirigible began conducting advertising & sightseeing flights from Washington-Hoover in 1934. But this soon became a dangerous obstacle for the increasingly large airliners landing nearby. 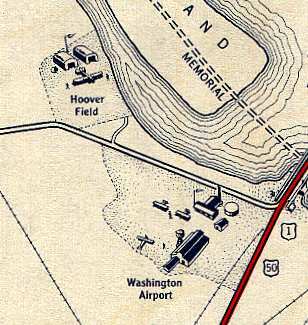 "Washington Hoover" Airport, as depicted on the 1935 Washington Sectional Chart. A circa 1935 photo of Phil Lefevre & his brother & sister at Hoover Field, with a Goodyear Blimp in the background. A remarkable 1935 aerial view looking north at Washington Airport (foreground) & Hoover Field (background), as seen from the Goodyear Blimp 'Enterprise' (Harris & Ewing Collection, Library of Congress). Two planes each were visible at Washington Airport & Hoover Field, which also had a blimp hangar in addition to 2 aircraft hangars. A circa 1930s photo (courtesy of Dallam Oliver-Lee) of a DC-2 taxiing in front of Washington Hoover's hangar. but Hoover Field across the road to the north was only labeled generically as “Airport”. over Washington Boulevard, on which vehicular traffic was blocked during takeoffs & landings. 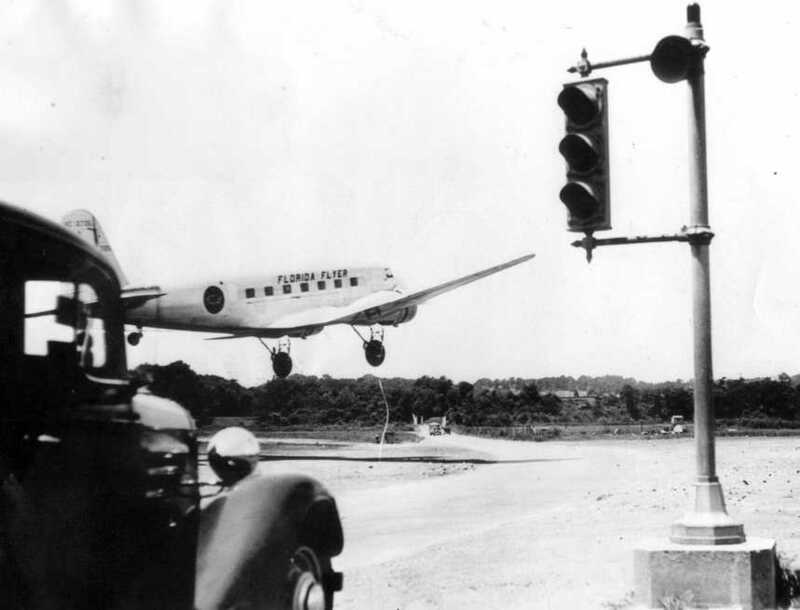 showing the traffic light which blocked cars on adjacent Washington Boulevard during takeoffs & landings. described Hoover Airport as having 2 sod runways, with the longest being the 4,200' north/south strip. 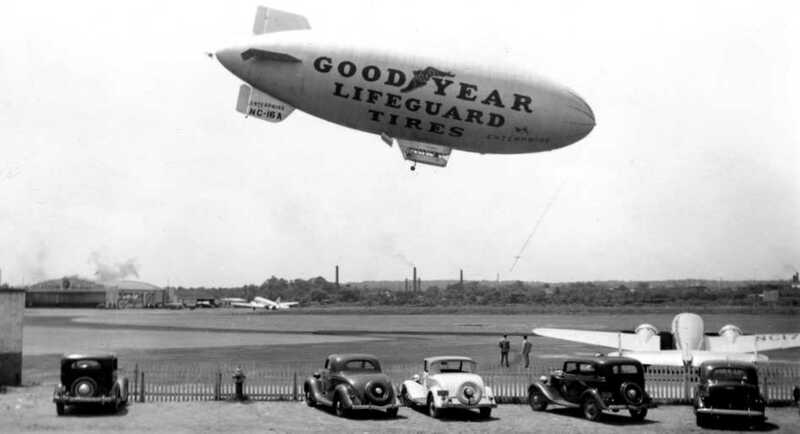 A circa late 1930s photo of the 1st Goodyear Blimp Enterprise over Washington Hoover Airport. 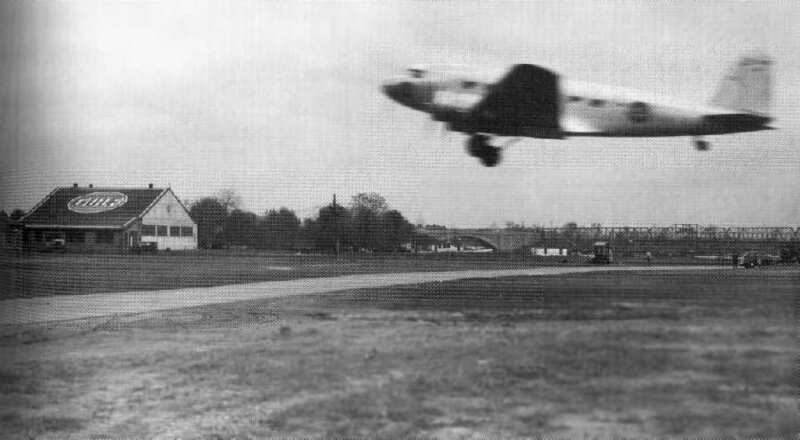 In the background is the Eastern Airlines hangar & an Eastern DC-2, and in the foreground is a twin Lockheed or Beech. 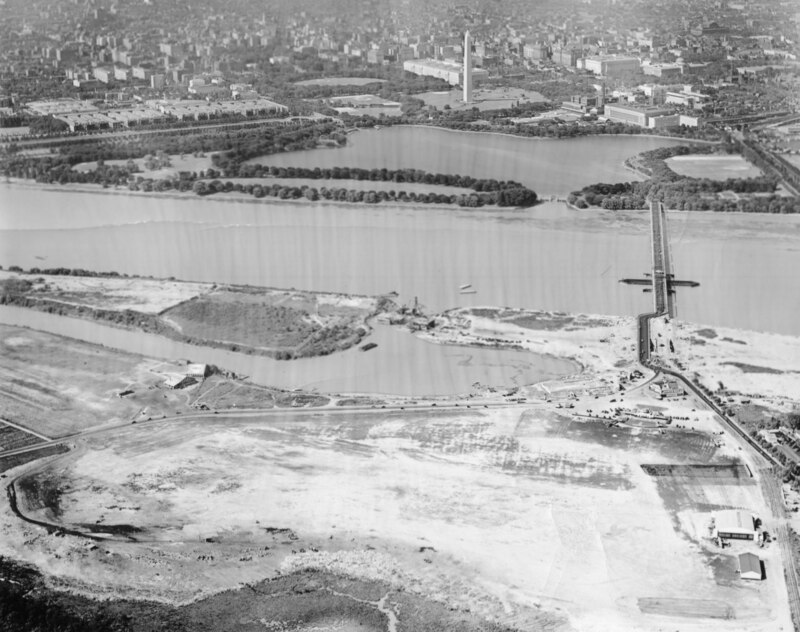 A circa late 1930s aerial view showing Washington Hoover in its later configuration, with 2 runways. 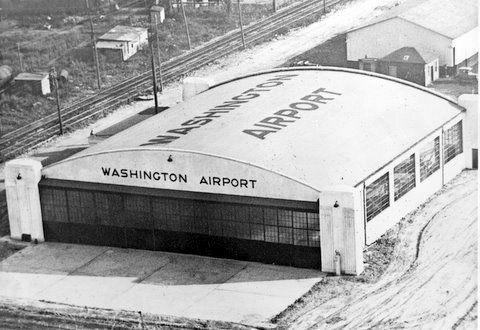 A circa 1930s photo of a hangar with “Washington Airport” painted on its side & roof (courtesy of Lester Hollans). 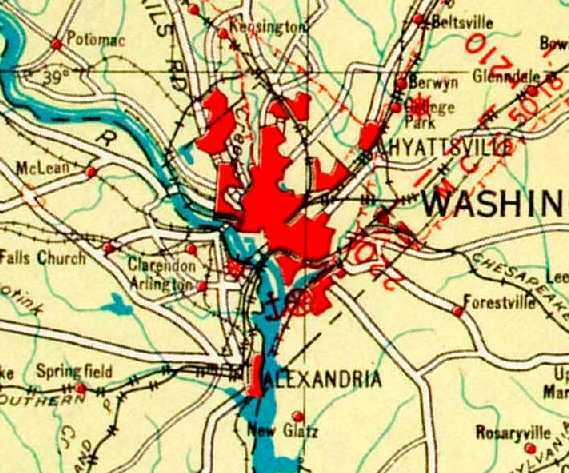 Washington-Hoover was reputed to have "the poorest aviation ground facilities of any important city in the United States or Europe." Wiley Post remarked that "there were better landing grounds in the wilds of Siberia than at Washington." and obstructed by a high smokestack on one approach & a dump nearby, the field was less than adequate. which had guards posted to flag down traffic during takeoffs & landings. there was no room for the airport to expand. 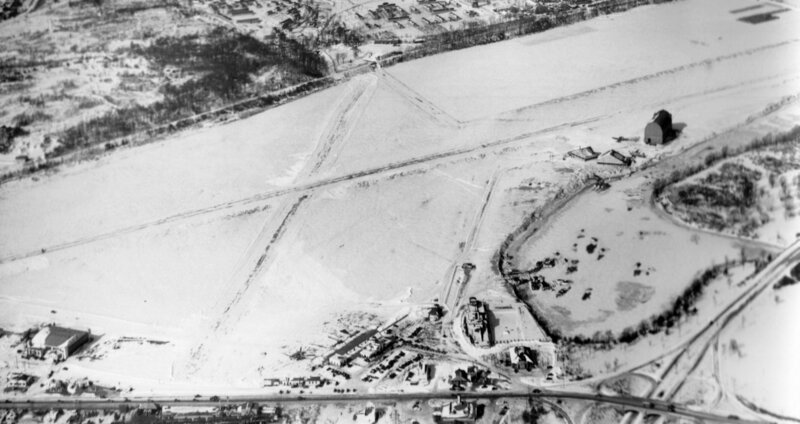 An undated photo (courtesy of George Miller) showing Hoover Field after it had been flooded. 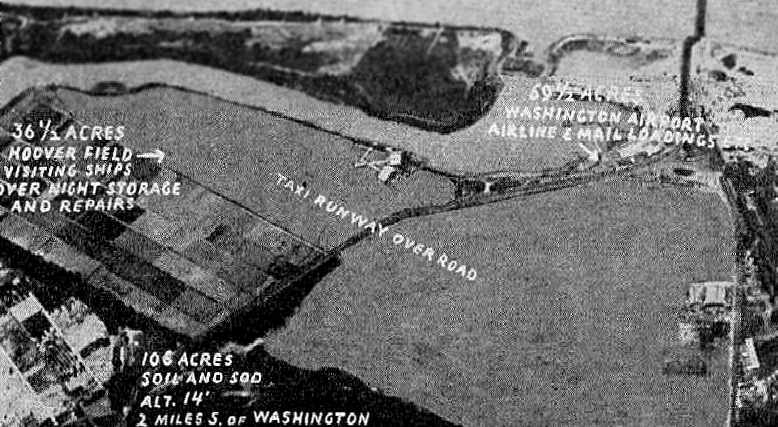 Due to its low-lying location next to the Potomac River, and its poor drainage, the airport site was prone to such flooding. 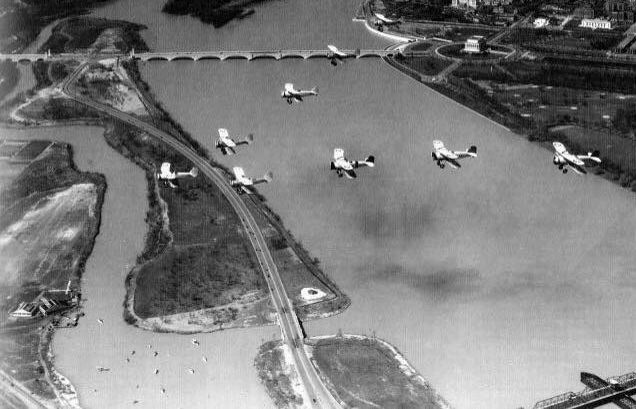 A circa 1930s aerial view looking northeast at a group of military biplanes overflying Hoover Field, just visible at bottom-left. An undated aerial view of Hoover Airport from a November 1939 depiction of Washington Restricted Areas (from the Philadelphia National Archives, courtesy of Ron Plante). A 1939 photo of passengers loading onto an Eastern Airlines DC-3 of “The Great Silver Fleet” at Washington Hoover Field (courtesy of George Mihal of the Office of Image Archeology). 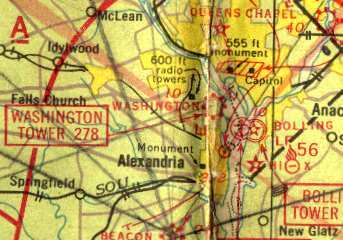 "Washington" Airport was still depicted on the 1940 Washington Sectional Chart (courtesy of Mike Keefe). 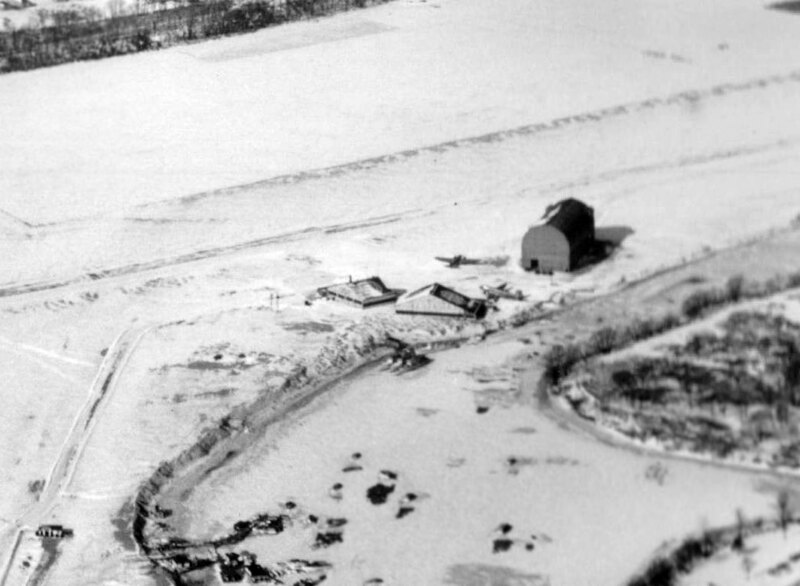 showing 2 snow-covered runways, and the buildings & hangars of both Washington Airport (bottom) & Hoover Field (upper-right). A closeup from the 1/27/40 aerial view looking northwest showing the 2 hangars, 2 aircraft, and a presumed dirigible hangar at Hoover Field. With larger aircraft becoming commonplace in the 1940s, Hoover's geographic limitations became a serious liability. 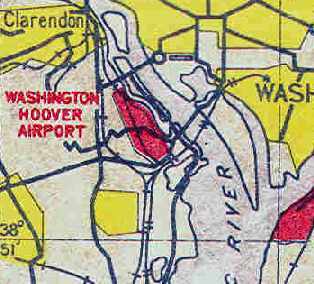 Hoover Field closed in 1941, when it was replaced by the much larger Washington National Airport, 2 miles southeast. but the new National Airport was. 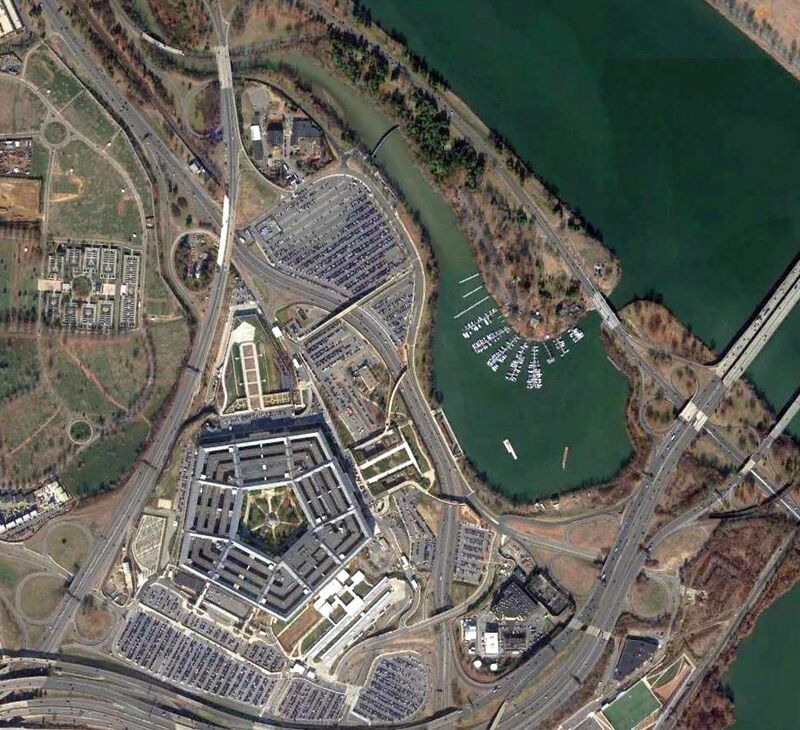 after it had been converted to be used by workers laying out the adjacent Pentagon building. 1,000 architects produced blueprints of the new building inside the Hoover Airport hangar. “In the summer of 1975 I was sent by the U. S. Army to become Airfield Commander of Blackstone AAF. When I got there, I found a usable control tower and a huge cinder block hangar. This giant old hangar seemed to be totally out of place. I went on the Virginia National Guard post to talk to the designated historian about where the hangar had come from. I distinctly remember his telling me it had once been located in Washington, DC - on the site of what is now the Pentagon! and brought to Blackstone Army Airfield for reassembly as a make-work project for a group such as the Civilian Conservation Corps. 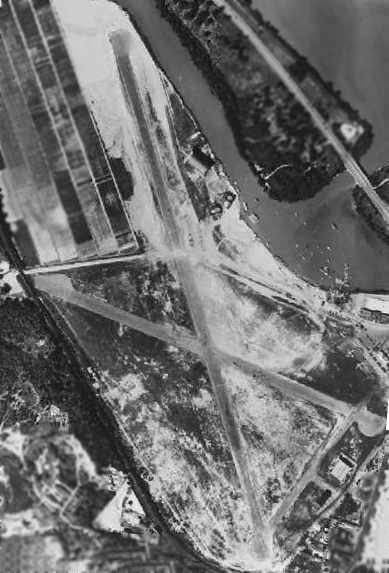 A 1949 aerial view showed that all traces of the former Hoover Airport had been erased. “I have just gotten about 200 of the original windows that were in the Washington [Hoover] Airport before renovating & merging. They are in fabulous condition & have been in a barn & out of the weather all these years. Panes are in good shape too! I have original pictures of them in & the contractor who removed them is the person I bought them from. 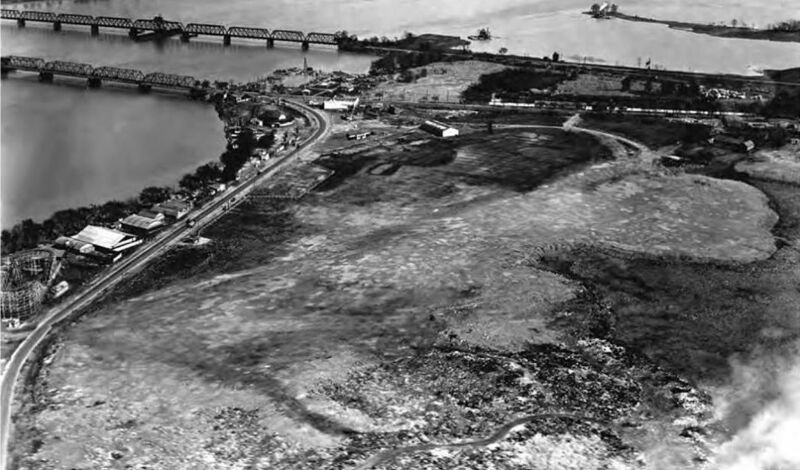 A 2016 aerial view shows no trace remains of Washington Hoover Airport. Washington History Magazine, Fall 1989.